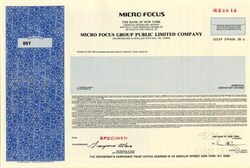 Beautiful engraved Specimen ADR certificate from the Micro Focus Group Public Limited Company dated in 1990. This historic document was printed by United States Banknote Corporation and has an ornate border around it. This item has the printed signatures of the Company's Officers. Micro Focus, a member of the FTSE 250, provides innovative software that allows companies to dramatically improve the business value of their enterprise applications. Micro Focus Enterprise Application Modernization and Management software enables customers' business applications to respond rapidly to market changes and embrace modern architectures with reduced cost and risk.